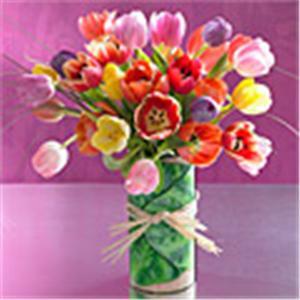 Multitude of bright & colorful tulips arranged in a simple, yet classic vase. The vase is styled with a ribbon for a decorative accent. Enjoy your tulip floral arrangements longer - They are the only flowers that continue to grow after they have been cut. Don't worry if they start to droop, just cut the stems and they will get straighter. Call if you have any questions about our products, arrangements, and flower delivery in San Diego! Pick up or deliver your tulips in San Diego!